After seeing all the posts and I am sure others out there are wondering if maybe they should call, the rep I spoke with was very nice and said to call the following number: 1-800-551-5544 (the same number on the back of your ID card) and ask them to send you a calender. HE said they have no problem with sending them out and is more then happy to send to anyone that requests one. I found out mine is also on it's way and can't wait to see it. Hope this information helps. Last edited by Mark on December 30th, 2006, 5:30 pm, edited 1 time in total. Thanks Mark, but would they send one to Western Australia? Would they give me one as a Guidant patient, hopefully future Medtronic patient when this one goes? karslake wrote: Thanks Mark, but would they send one to Western Australia? Eve, I don't see why they wouldn't. Give them a call and rattle their cage - let us know if they send it. jana wrote: Would they give me one as a Guidant patient, hopefully future Medtronic patient when this one goes? Jana, I don't know but tell them that that lovely family on the front page are members of the same support board as yours and see if they will- I imagine they would! Well, at 1.30am this morning, I rang Medtronic (it is not a free call from Australia). After going through the 'press 1 for... etc. etc.' I eventually got a live person. I explained that I had a Medtronic Maximo ICD and that I would like a calendar, if possible, as the cover picture was of friends. I was asked 'Calendar? What calendar?' I explained and asked if it were possible to have one sent to Australia. I was told to hold the line, which I did - for 10 minutes - and the line was dead. I later rang Helen to wish her a Happy Birthday and told her. She said she would ask Medtronic for a calendar for me. Then I went back to bed. Grrrr... now that rep is making me look like I'm a fibber, and I hate when I am made to look like a fibber especially since I don't fib~! I am calling Medtronics right now. Results in a few minutes! Okay, just spoke to patient services who apologized repeatedly for any mix up or lost calls. I explained that situation about people outside the US and those wanting to Medtronics calender as Cyndie and kids are the cover family. AT this time of night, no one is there in patient services, only the ones that can make changes in patient information so I was switched to a supervisor. She took down my information and guaranteed someone would return my call tomorrow morning about this problem. I suggested to her that if it would be easier they could send me 20-30 copies and I could send them from here to our family members outside the US. She thought that would be a great idea and again she apologized for confusion and lost calls. After I receive tomorrows call I will post and relay the information- I am sorry but just hold tight, I will get it resolved for you guys. BTW, I was very diplomatic and calm on the phone, and even my wife commended me on how I am able to control my self better then I used to... see, all it takes is an SCD to make anyone a teddy bear. Thanks Mark, for all the trouble you have been to. Much appreciated. Mark and all, used the number that you gave for us to contact. Called yesterday, got my calander today. Before anyone gets mad, the headquarters is in the State of Minnesota not far from where I live. They were helpful and ready to send one out. Checked their records and made sure I was an owner of their unit - Happy New Year and Christmas, to those in the UK - Happy Boxing Day. Mark How is the Calendar Caper coming a long? Any news yet? Last edited by John C on December 18th, 2008, 2:36 am, edited 3 times in total. 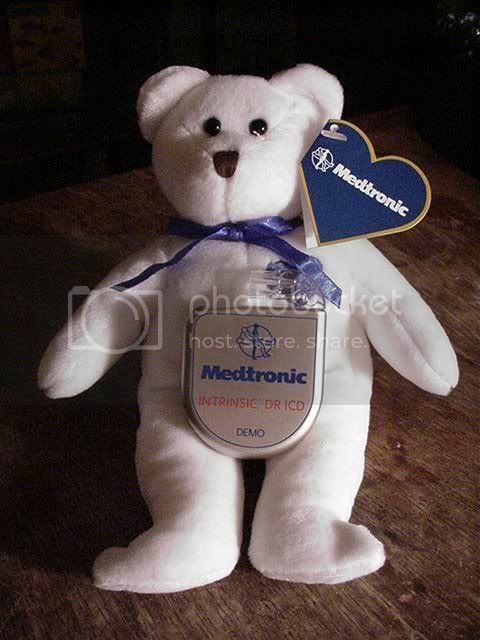 Here you go, Earl the bear and my Intrinsic Demo from Medtronics.